I’ve never properly planted potatoes, though once I did stick a sprouty spud into the window-box and forgot about it; months later I wondered what was growing and investigated; had half a dozen spuds to go with my dinner. But proper spud-growing is a lot of work, I’ve read; the plants have to be ridged up as they grow, again and again and again. I got a “potato planter” – one of those round nylon things. The instructions said to half-fill the tub and plant three potatoes. As they grow, add soil to raise the level. Only three spuds? I thought; that’s not going to feed me for long. And I put it to one side and forgot about it. I had some starting-to-be-sprouty potatoes in the fridge, and I thought about planting them. But only three at a time in a single tub? Why not use old compost sacks instead? Roll them down, plant them, and then unroll the tops and top up the soil as the plants grow. 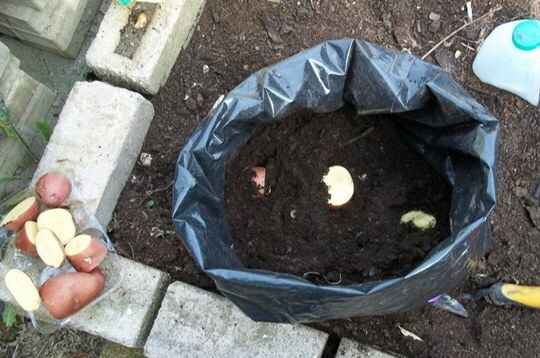 Found several clean sacks – well, clean on the inside, where it matters – and put a couple of holes in for drainage. Chucked some bark in the bottom, added some soil. I had no idea how much soil I should put in, but I filled about a third – hard to tell when the upper bit’s rolled over on itself. I scooped out some soil in my going-to-be-raised-bed-veg-garden-when-I-get-round-to-it. I’d been dumping spent soil from repotting plants to use as a base layer, and so I hadn’t been watering it: it had baked hard, and I wasn’t able to get down as much as I wanted. 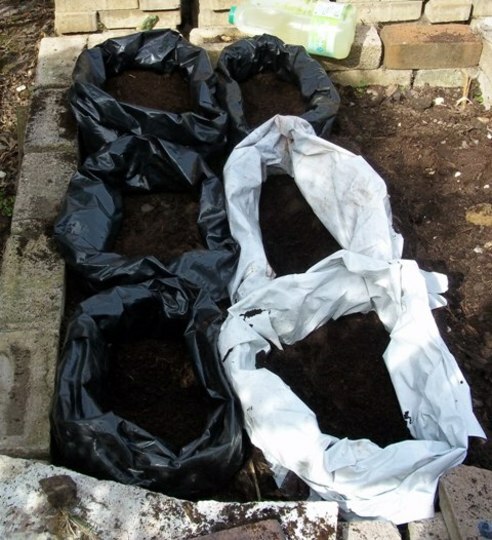 But I managed to scrape out a shallow trough, then put the sacks in, piling dirt around the outsides and between the sacks to both support and insulate. Placed the cut potatoes, three bits per sack – I’d read that they should be cut so that each piece had a sprouty bit. I had enough bits for four sacks – with an extra bit stuffed into one of them. I also had some new potatoes which had been in the fridge for too long; they weren’t sprouty, but they were looking a bit sad and wrinkled, so I shoved them in too, whole. They’re in the white sacks. Watered them all in and forgot about them. 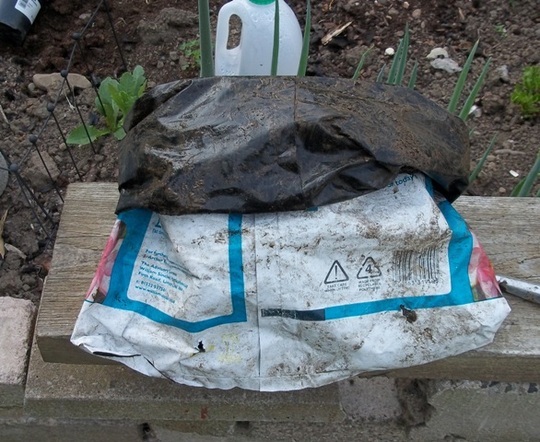 I unrolled the sacks a bit and put some more compost in. I wasn’t sure how high to take it, but raised the soil level to about an inch under the lowest leaf. I’m making this up as I go along, so I’m going to make a lot of mistakes – probably already made a few, just not realised it yet. One thing I did realise: I should have dug the sacks deeper into the ground – if I’d had a pickaxe and room to swing it! But I intend the eventual raised bed to be higher than this, so that should give me more “planting depth” in future. 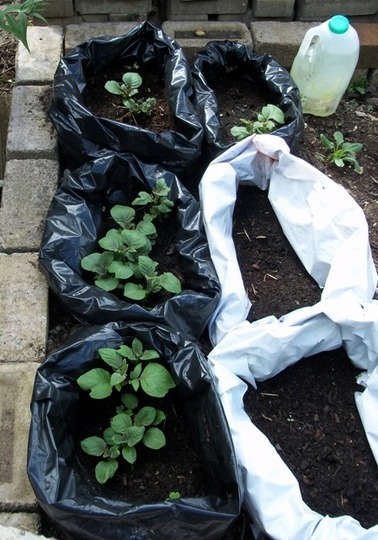 I don’t know how tall the plants will grow, so how much I’ll need to unroll the sacks. I’ll have to use bamboo canes to support them. I won’t have to buy “purpose” planters; I’m re-using plastic sacks of which I have a stack and a half. We tries something similar years ago but had little success. We had seen a TV interview with a chap who got POUNDS of potatoes doing it this way. Well it didn't work for us and, as my OH isn't interested in vegetable growing , that was that. Having seen your work in progress, Fran, I'm very tempted to have a go. There's nothing like a home-grown potato and we have loads of compost in the Compost Heap. Well, there's two chances: either it'll work, or it won't. This time, anyway: so many variables that changing one thing very slightly could make a big differnce to the result. Prob is to know what to change, and by how much! ps thanks for your ps, I'll save the link in a couple of places, then I might be able to find one of them later! But it works for some so why shouldn't you be the one! It was on TV?? Lol and here’s me thinking that I invented this! Well, I did invent it – for me. Cover all the leaves and foliage, you mean? I’d never have thought of that, and in fact I didn’t: leaves need light??? And they’ll need to be above ground to flower? But I’ve got four sacks, so I’ll try it with one and see what happens – of course, if I keep burying the leaves I won’t see anything happen. This is an experiment on my part: no idea what I’m doing or how to do it! But if I try different methods I’ll have some sort of cross-check on what worked and what didn’t – or what worked better. I tried growing potatoes in potato sacks for a couple of years. I gave up, deciding the efforts weren't worth it. Hope you have better luck.